grandma's cookie jar: SoulFeed Box from LifeTree Family & Save $5! Yesterday I wrote about one of the most important things we can do as grandparents to pass on a heritage of faith and shared LifeTree/Group's Buddy Box with you. While many of us have younger grandchildren - grades four or five and below - many grandparents do have grandchildren who are in college, so today I'm very happy to let you know about a unique and excellent resource for college kids, which you can send to your college-age grandchildren . . . and you can save $5, too! 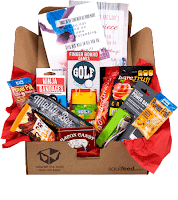 Subscription boxes have become quite popular - you can get them filled with most anything; in this case, the SoulFeed box is a subscription box which is filled with items to get college students thinking about God, His love for them, and their walk with Him. You may choose the length of your subscription for these care packages - monthly, every four months, every eight months or individual boxes, which gives you a lot of flexibility! Group Publishing/Lifetree sent me one box for free, so I could see what is inside and let you know all about it. Each box has one over-arching theme - the box I received focused on Surviving and Thriving Finals Stress-Buster. You are able to designate if your SoulFeed Box is for a male or female student and the contents are chosen accordingly to specifically encourage and delight! Inside each box you'll find an excellent combination of items - such as four spiritual reflections with Scripture, prayer and an encouraging mini poster on the back of each one - great way to help your college student focus on God each week of the month - three or four high quality snacks - the box I received was for a guy and had caffeinated cocoa, a brownie, a bacon snack and raw peppered, bbq pumpkin seeds - and fun surprises - puzzles, stress balls, massagers and more were in the box I received. All the fun items in the box have a point - a reason for being there - to give families an opportunity to connect and encourage their college student to remember to stay connected with God, His love, His Word and how it lives in their lives. Encouragement for students to take time to thank their parent/grandparent /friend who sent them the box. Lifetree says; "SoulFeed is the college care package which truly says, 'I love you' by allowing parents, grandparents and friends to provide consistent spiritual encouragement for a loved one during the college years . . . plus yummy snacks and fun stuff! Now you can feed their mind, body and soul!" I love the idea of a subscription box for college students and I think Lifetree/Group has done an excellent job with their SoulFeed Box! SoulFeed is a care package filled with items students will enjoy - and just have fun with each time a new box arrives! So, the SoulFeed Box is, in my opinion, an excellent resource for families to use with their college age children/grandchildren to help them as they are away at college and to stay connected and focused on continuing to pass on a heritage of faith. SoulFeed makes sending a care package very easy and fun - for you and for the college students who receive them. And, I'm very happy to say, if you use this link and the code - LYNDA5, you - and each family in your ministry - will be able to save $5 on the SoulFeed Box or subscription of their choice! 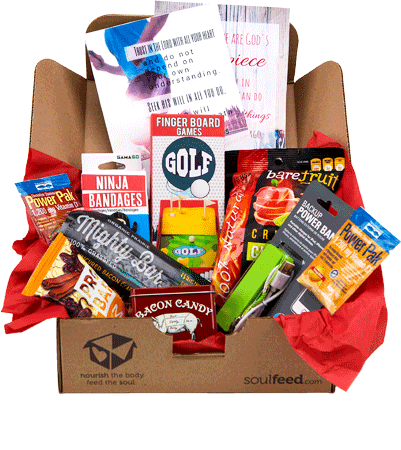 What a great way to give a SoulFeed Box a try! Check on out and spread the word to the families in your church!